Whenever I tell my family we are heading to our SONIC Drive-In for a meal they get so excited. My husband and kids always have this restaurant at the top of their list for fun, tasty family outings! We love that it is like a classic drive in restaurant so we can eat at an outside table or even have the food delivered right to our truck. Since it had rained for three days, we were ready to head out to our Longwood, FL SONIC Drive-in and have a delicious lunch outdoors enjoying the sunshine. SONIC Drive-In has a fabulous new promotion running for a limited time (through February 17, 2014) that the kids are sure to love. In Sonic’s Wacky Pack kids’ meals children will receive a limited edition Scholastic book. My children were already reading their book during the meal and continued to read these cute, little books on the drive home too. I love that these books are also available as e-books too so kids can check out virtually too! There are four great books available for kids to collect (and trade) including Dinosaurs, Bugs, Ocean and Sea and Night Sky. I love that each of these books has educational content that is presented in an exciting way that actually encourages children to want to read. 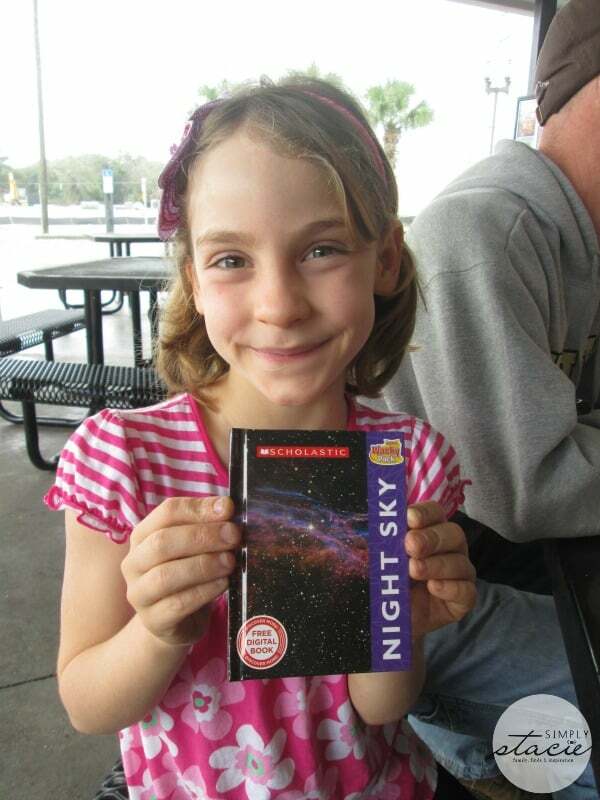 My eight year old son enjoyed telling us new facts about the Night Sky while my two younger children who are learning to read had a blast trying to read the books out loud by themselves. I appreciate that SONIC is committed to helping support education for children with various projects and this Scholastic promotion in particular is a big hit in my opinion. Our entire experience was great….this was also the first time that they have had a Wacky Pack kids’ meal and they thought it was delicious. The customer service was friendly and of course, my husband and I enjoyed sharing a chocolate shake made with real ice cream. Don’t miss out on collecting these four limited edition Scholastic books at your local SONIC Drive-In through February 17th and enjoy some great food too! I visited the site. I haven’t been there for awhile and learned that I want to try their Java Chillers and Coney Dogs. I learned they have 25 milkshake flavors. Thanks for the giveaway…we like the Chicago Dogs @ Sonic ! I like the Blue Coconut Slush. I like that you can look at the Sonic menu on the website and get an idea of what you plan to purchase before going to sonic. I learned that they had $1 menu items on President’s Day. And I missed it! ?